Fancy a fancy cake?! I would like to welcome you to my very first fondant covered cake. As some of you may or may not know about me from reading my About Me page, I completed a Patisserie course a few years ago and that is where i learnt how to cover a cake in fondant. Along with many other subjects such as petit fours, chocolate making and breads & pastries, cake decorating was definitely one of my favourites. So last week i decided to test my skills again in covering one of my favourite gluten free chocolate cake recipes with a contemporary fondant pattern, marble!! I know marble is so popular and trendy at the moment and i absolutely love it! My laptop case and phone case is marble and now so is my cake. When i first saw the marble fondant trend on Pinterest i fell in love and i knew i had to try it for myself. The only problem was i didn’t know how to do it, cue YouTube! I found this fondant with marble effect video from Cake Style and it was so helpful. 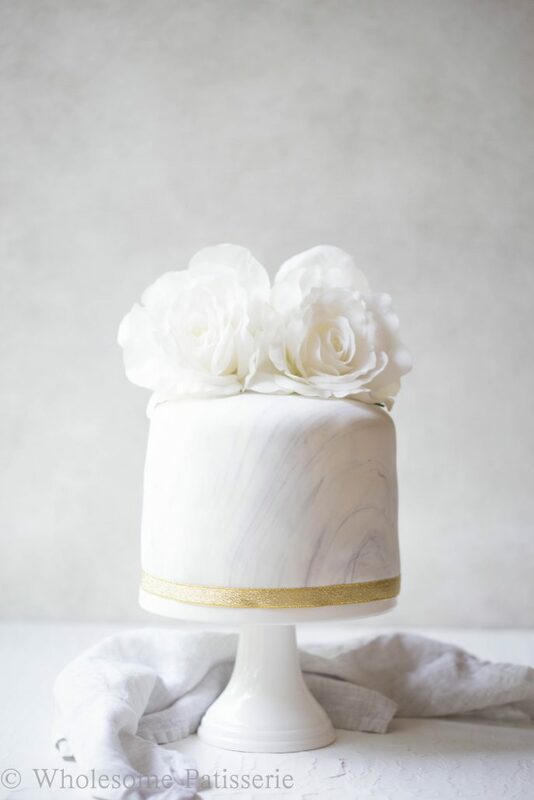 I followed Vanessa’s steps in the video to achieve my marble effect with the fondant so i highly recommend that you give this video a watch if you want to achieve the same result. Now lets get down to the cake inside. Surprise surprise! 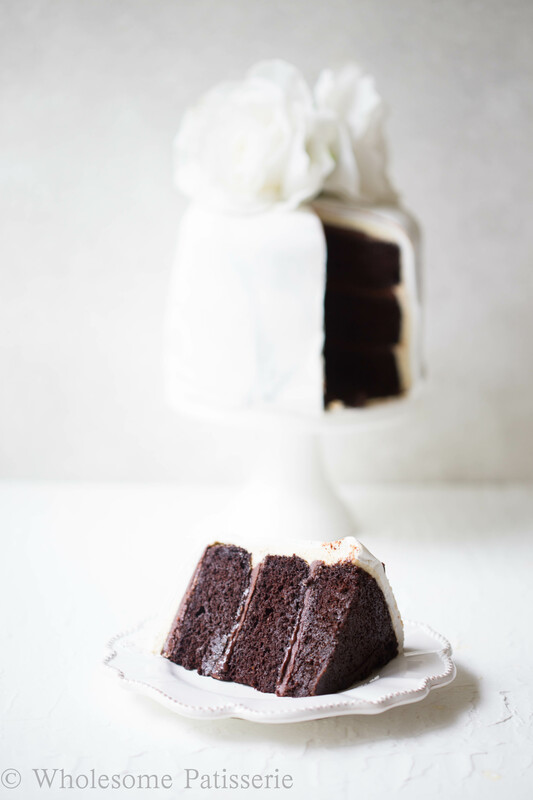 It’s my classic and trustworthy gluten free chocolate cake recipe, how could i use any other? Please note: As you can see from my photos, i have 3 layers or cake. I divided my batter into 3 equal parts and baked them in separate baking tins. 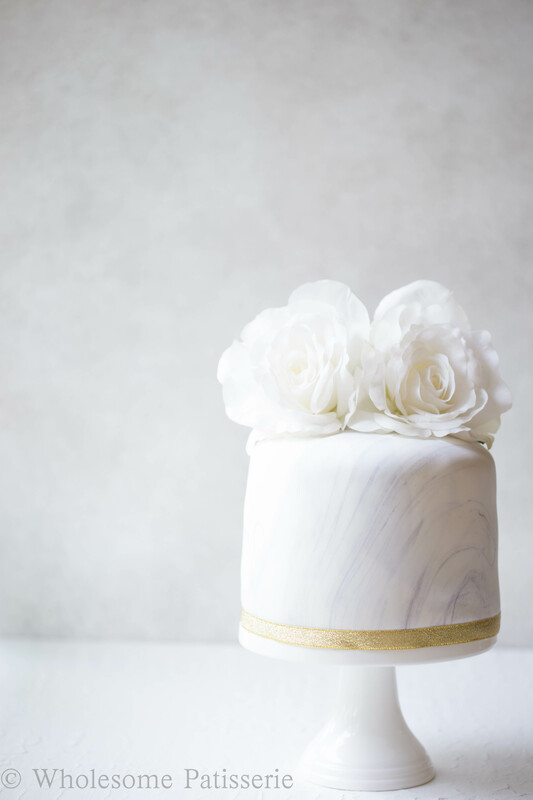 I have also provided you with a few video tutorials in the recipe instructions below on how i assembled my cake, created the marble fondant and how to cover the cake in fondant. Please give those videos a watch to achieve the same outcome i did. 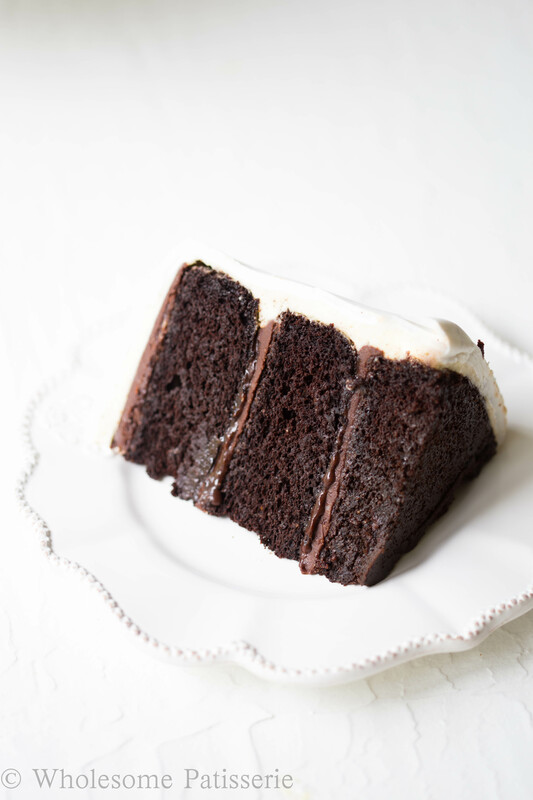 Sandwiched between each layer of cake is a divine vegan chocolate frosting made from coconut oil and raw cacao powder. The outside frosting layer is a classic vanilla buttercream. All of this is then covered by a beautiful marble effect fondant topped with fake white roses and a sparkly gold ribbon for a touch of bling. I know this is a little fancy for my blog and maybe a bit more involved for you but i hope you can appreciate it as much as i do and even give it a go for yourself one day. Perfect for a special occasion! In a large bowl or the bowl of a stand mixer, whisk together milk and coffee until coffee has completely dissolved. Whisk in eggs, sugar, oil and vanilla. In a separate medium bowl, whisk flour, almond meal, cacao, baking powder, baking soda, guar gum and salt. Gradually add the flour mixture into the milk mixture, beating slightly between each addition. Beat mixture for a further 2 minutes or until well combined and the batter has thickened. In three separate bowls, divide batter into three equal parts. Pour each bowl of batter into each prepared cake tins, cooking 1,2 or 3 at once, depending on how many cake pans you have. (see notes). Bake for 15-20 minutes or until a skewer inserted into the middle comes out clean. Let cakes cool in pan for 5-10 minutes. Remove cakes from their pans by turning them over onto a wire cooling rack. Tap on the pan slightly to help the cakes come out. In the bowl of a stand mixer or using a hand mixer, add coconut oil and ½ cup of the icing sugar, whisk until just combined and soft. Gradually add the remaining icing sugar. Add 1 tbsp almond milk at a time or when needed, to help bring the mixture together. Add in vanilla extract and beat well until smooth and fluffy. In the bowl of a stand mixer or using a hand mixer, add butter. Using the whisk attachment, whisk the butter for 30 seconds or until just soft. Between the addition of the icing sugar, add almond milk, 1 tablespoon at a time. Beat for a further 1 minute or until light and fluffy. Use the chocolate frosting between each layer of cake. Spread a small amount of the frosting to sandwich each layer together. Use the vanilla buttercream for the outside frosting layers and on the top of the cake. Remember: You will not see the frosting underneath the buttercream so it’s fine if the chocolate and vanilla get mixed together. Please watch this video on how i covered my cake in fondant and created the marble effect. Decorate with fake white roses and a sparkly gold ribbon. This cake will give you 3 equal layers of cake. I used 2 x 6” round cake tins to bake each layer in. If you have 3 spare cake tins you can cook all three layers at once. If you only have one, you will have to cook one layer at a time, leaving uncooked batter in separate bowls aside until ready for baking. I had chocolate frosting on hand so i decided to use that between each layer of cake. I didn’t have enough for the outside crumb coat so i decided to make a vanilla buttercream for that. If you wish, you can make extra vanilla or chocolate to use just one flavour of frosting for your cake. I have provided you with video tutorials in the instructions and below on how i achieved the assembly of this cake. Please watch and follow along with each video to achieve the same outcome. This cake will keep in the refrigerator, covered in plastic wrap, for 1 week - 10 days. This is such a beautiful cake. It looks so simple at first but then you look closer and realize all the amazing details. I’m sure it tastes as amazing as it looks too!